Ngrjuna, the most well-known Buddhist thinker after the Buddha himself, points out in his famous Mlamadhyamakakrik that 'The Buddha's teachings of the Dharma is based on the two truths: a truth of worldly conventions and an ultimate truth' (XXIV:8). This doctrine of the two truths does indeed lie at the very heart of Buddhism. More particularly, the phenomenological and soteriological discourses in the Mdhyamika tradition revolve around ideas concerning the two truths. Central to the doctrine is the concept that all phenomena possess dual characteristics—conventional and ultimate. The former, defined as the mode of phenomenal appearance, is the conventional truth; while the latter, defined as the ultimate mode of being, is the ultimate truth. 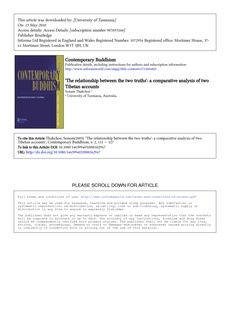 This paper examines the ways in which these two truths are related from the Tibetan Prsangika Mdhyamika perspective, and argues that there are two radically distinct Tibetan ways of reading and interpreting the issues surrounding them. It does so by comparing the ccounts of Tsong khapa Blo bzang Grags pa (hereafter Tsong khapa, 1357-1423 A.D.) and Go rampa bSod nams Senge's (hereafter Go rampa 1429-1489 A.D.), and focuses on the way in which the two truths are related. It will be argued that, for Tsong khapa, the two truths constitute a 'single ontological identity' (ngo bo gcig) with 'different conceptual identities' (ldog pa tha dad), whereas for Go rampa, the truths are separate in a way that is 'incompatible with their unity' (gcig pa bkag pa'i tha dad) or identity.